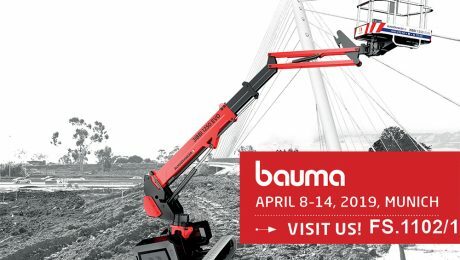 We are pleased to announce the AlmaCrawler’s partecipation at the Bauma 2019 in Munich Messe München, the biggest trade fair in the sector! 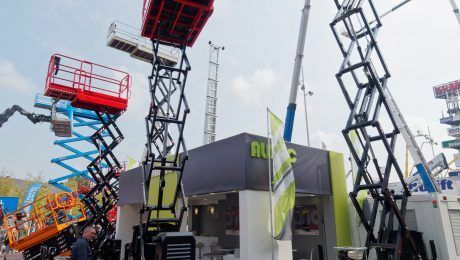 At the fair, we will introduce the most revolutionary machines in the access industry, namely the four Almac’s line HE-LINE, BL-LINE, ML-LINE and JT-LINE. 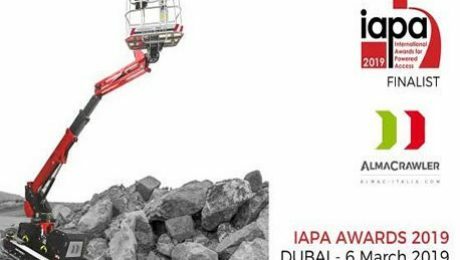 World Premier will be the winner of “Product of the Year” at IAPA AWARDS 2019 in Dubai, the JIBBI 1250 EVO. The machine will be shown with an innovative Winch Kit, alternative to the traditional aluminium basket. As its side, the full electric version, the JIBBI 1250 ELC – 100% battery powered. 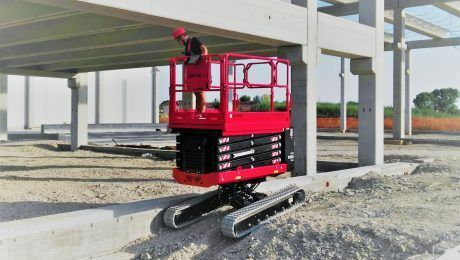 Almac produces crawler lift unique to their kind, providing real solutions to the needs of various day-to-day applications, for both end users and professional hiring companies. BI-LEVELLING aerial platforms make use of a newly developed system covered by a worldwide patent, which has enjoyed international recognition. Come to visit us at booth FS 1102/1! We are pleased to announce our victory at the IAPA AWARDS 2019 in the “Self Propelled Booms & Atrium Lifts” category with the new JIBBI 1250 EVO. With a large number of technological innovations, the JIBBI looks like a self-propelled telescopic boom with excellent performance. This machine guarantees a working height up to 12.2 m and a outreach from 5.5m to 7m. This victory, like that of 2016, is a reason of pride and satisfaction, pushing us to improve every day. 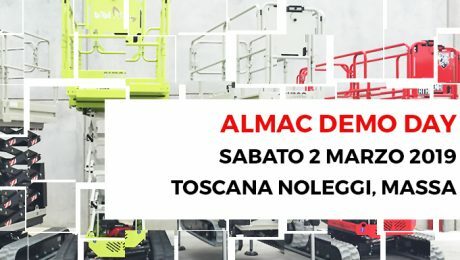 Sabato 2 Marzo 2019, presso la sede della TOSCANA NOLEGGI Srl di Massa, si terrà una giornata dedicata alla presentazione della gamma AlmaCrawler! Dalle 09:30 alle 17:30, potrete vedere i nostri prodotti incontrando il Team AlmaCrawler, dove saremo a disposizione per rispondere a tutte le vostre domande. Sarà possibile effettuare un test pratico su ogni macchina, al fine di toccare con mano le alte performance dei nostri prodotti. Sul piazzale interno alla sede della Toscana Noleggi Srl, in Via Massa Avenza 81 a Massa, troverete la nuova nata JIBBI 1250 EVO, accompagnata dalla piattaforma cingolata bi-livellante BiBi 1090 BL EVO e dal trasportatore cingolato MULTILOADER 2.5 in versione Performance. 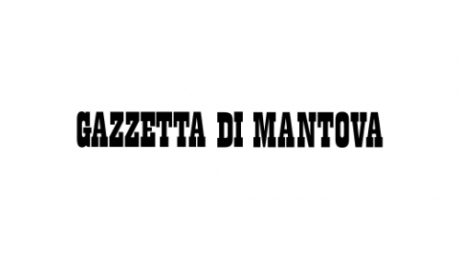 *In caso di maltempo, l’evento si svolgerà al chiuso!! TRANSPOTEC 2019… TOWARDS NEW ROUTES! AlmaCrawler will take part in TRANSPOTEC, the international transport and logistics fair, from 21st to 24th February 2019! During this event it will be possible to touch the Multi Loader, the tracked loader with Bi-leveling system. Visit us at Veronafiere STAND C 4.1 PAD. 6. Our Team is waiting for you to illustrate the range of products and answer all your questions! Find out more about the TRANSPOTEC 2019 event. AlmaCrawler has been selected as a finalist for the prestigious IAPA awards, with its new self-propelled telescopic boom JIBBI 1250 EVO, which thanks to its characteristics and excellent performance competes as best product in the category “Self Propelled Booms & Atrium Lifts”.The International Awards for Powered Access (IAPAs) and the IPAF Summit conference will be held in Dubai UAE on the 6 March 2019. 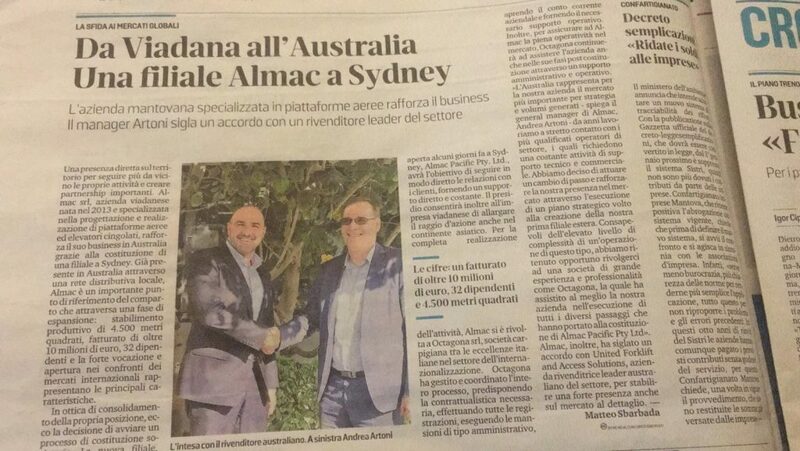 Today, 19 December 2019, on Gazzetta di Mantova it is possible to read an article with interview by our General Manager Mr. Andrea Artoni, in which a point is made on the situation of the company and the motivations that has led Almac and the aerial platform of the company to strengthen its presence in Australia with the inauguration of a new branch, Almac Pacific Pty Ltd, and the collaboration with United Forklift and Access Solutions, an australian company that is an expert in the sector. 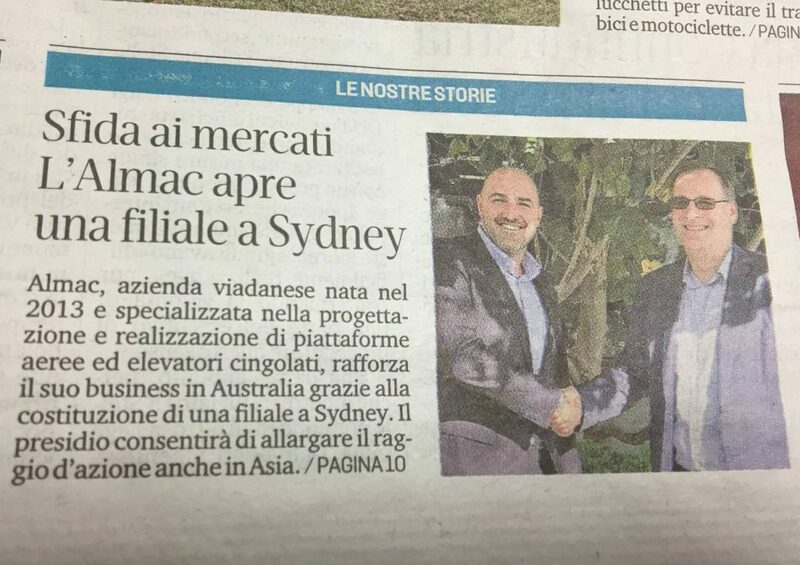 Almac has arrived on the important Australian market creating a new company, Almac Pacific Pty Ltd, a company that will manage customers and businesses on the territory, with the aim of further improving the presence services in Australia. 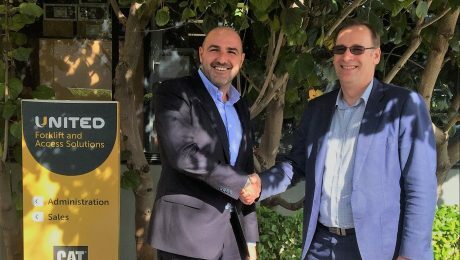 Furthermore, Almac has signed an agreement with United Forklift and Access Solutions, an Australian leader in the sector, to establish a strong presence also on the retail market. 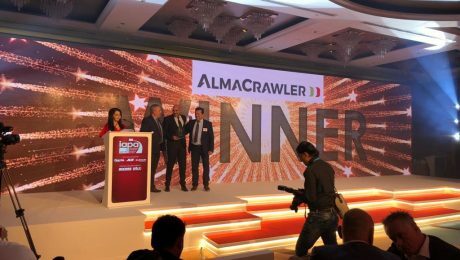 From the combination among the term crawler, which point out the crawlers as distinctive feature of all product families, the company name and the Italian flag, the new Almac logo is born. The symbol is developed to underline the deep “Made in Italy” know-how typical of the enterprise, but also represents its constant internationalization process. Finally, the emblem is the perfect synthesis between the founders innovative ideas and their professional values, which are now taken as a point of reference by a team that grows day by day and works with passion, to offer customers from every continent a high performance technological solution, which can simplify any type of operation in height. Exhibition’s season is to begin. Come to see Almac’s range and new products development at the upcoming exhibitions! The largest lifting equipment event for the UK and Ireland is now located at Donington Park in Leicestershire. We are pleased to meet you at the official Almac ‘s booth #408 Come and Check all our unique range of product. Australia’s most important hire industry event, the Hire and Rental Industry Association’s 50th Convention, HIRE18, takes this year place in Brisbane. You’ll find us at the booth #078 of our australian dealer Aspac Group . See you there! BIBI 1090-BL EVO – New Video !! BIBI 1090-BL EVO – Discover in the video the innovative performances of the New Self-Propelled Machine by Almac !